Patrizia Spadafora has always combined her commitment to the fashion industry with her passion for contemporary art. After graduating in Political Science from the University of Bologna, she completed her post graduate studies in New York at F.I.T. where she achieved a Master’s Degree in Marketing. Patrizia Spadafora has worked for many years in fashion, managing the family’s international business. While living in New York in 1984, she founded and directed Spadafora U.S.A., Inc. – a company which focused on the distribution of fashion brands made ​​in Italy. During that time in New York she got close to the art world, meeting artists, gallery owners, critics and curators. When her commitment with fashion came to an end in 2004, she could finally dedicate herself to contemporary art on a full time basis, combining her management skills with her strong passion for the arts and culture. She has developed an extensive network and know-how to serve her consulting business, specializing in designing and coordinating events and exhibitions of contemporary art. She has worked with many international artists, including Joana Vasconcelos, Jason Martin, Robert Pan, Aron Demetz and others. 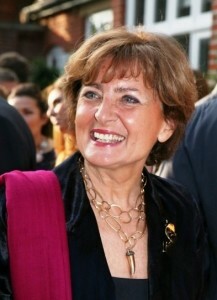 In 2011 she became Vice President of the Venice Guggenheim Circle and currently she is President of the ArtintheAlps Association. She’s married to Paul with whom she had three children, all living and working far away from Italy, but always close to her heart.